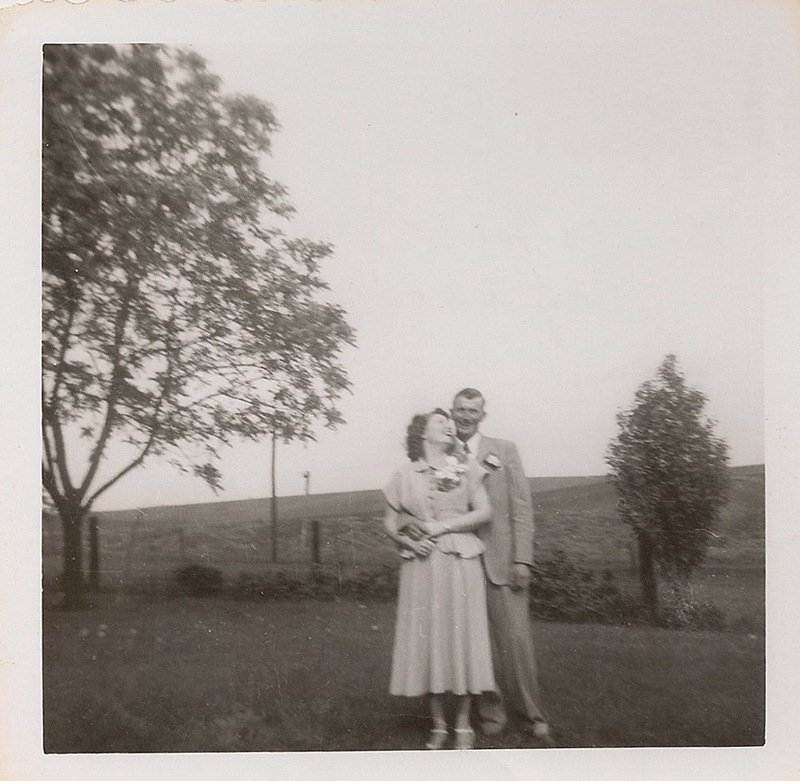 Gardening was an important part of my grandparents’ life on their farmstead in western Iowa where my father grew up and also where I grew up. Originally the area around the house was bare of plants but with time Grandpa Henry and Grandma Olga planted numerous trees, bushes, flowers and a lawn around the home. 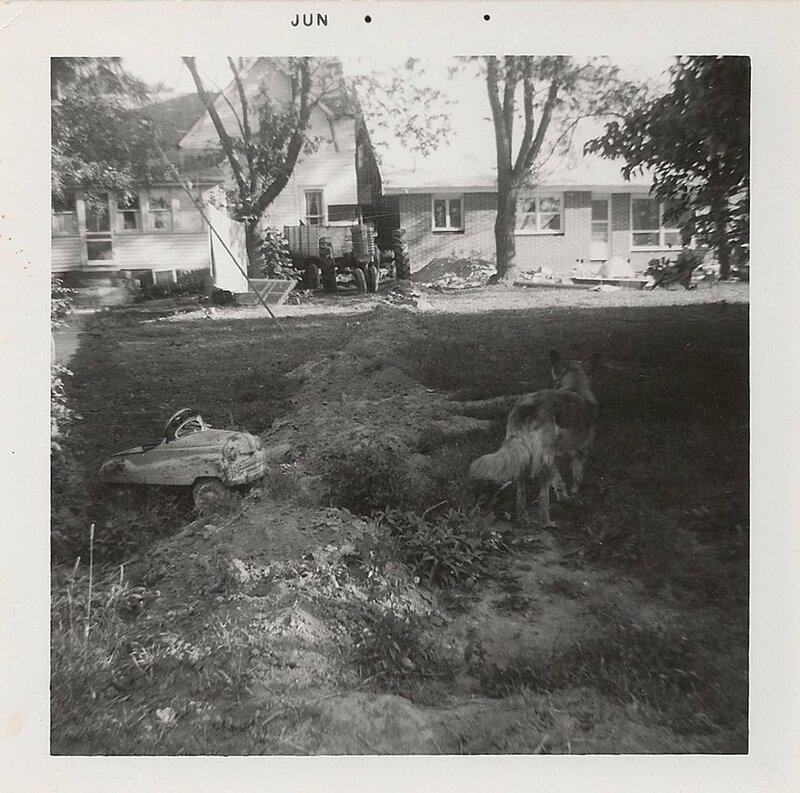 Of course the home needed shade for the hot summers so four walnut trees were planted. As a child I remember stepping on and smashing the walnuts to remove the green hulls and later using a hammer to crack open the walnut shells to retrieve the meat inside. 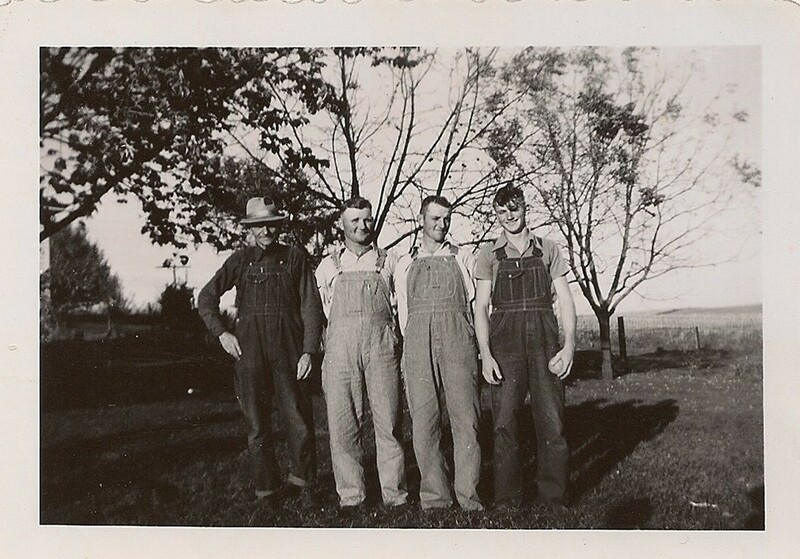 To provide fruit for the family three apple trees were planted; one for each of son – Walt, Ed, and Harold, my dad. During the summer I would climb and play in these apple trees and in the fall I would help pick the apples. The apples were eaten fresh or frozen to make pies, crisps or other desserts. Other fruit trees included two sour cherry trees. Each summer my sisters and I would pick and pit the cherries. Typically we canned or froze the cherries to be used in making desserts. Grandma Olga loved her flowers and a nice variety of these were planted around the home. Orange trumpet vines had been planted on both sides of the gate that grew into a nice canopy over the gate. Being a favorite of my dad, a slip of the trumpet vine was moved to the backyard of his retirement home he had built several decades later. The trumpet vine is still growing there on a wooden fence today. Orange poppies were a favorite of Grandma Olga. Every summer the poppies grew on the southeast corner of the house, but unfortunately the poppies are no longer there and my Dad misses them when he visits the old farmstead. 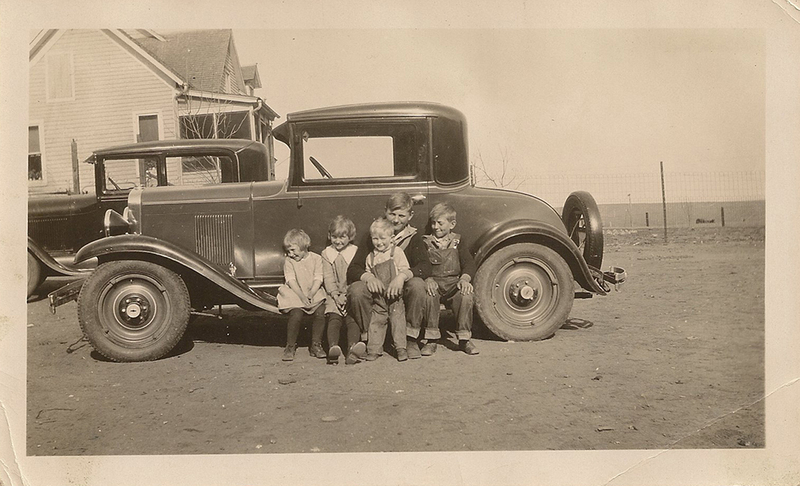 Grandma Olga had old-fashioned hollyhocks around the water pump on the west side of the house. As young children my sisters and I had fun making hollyhock dolls out the blossoms, using toothpicks to connect the blooms together. One of my favorite plants was the old-fashioned deep purple lilac bush that my grandparents had planted. 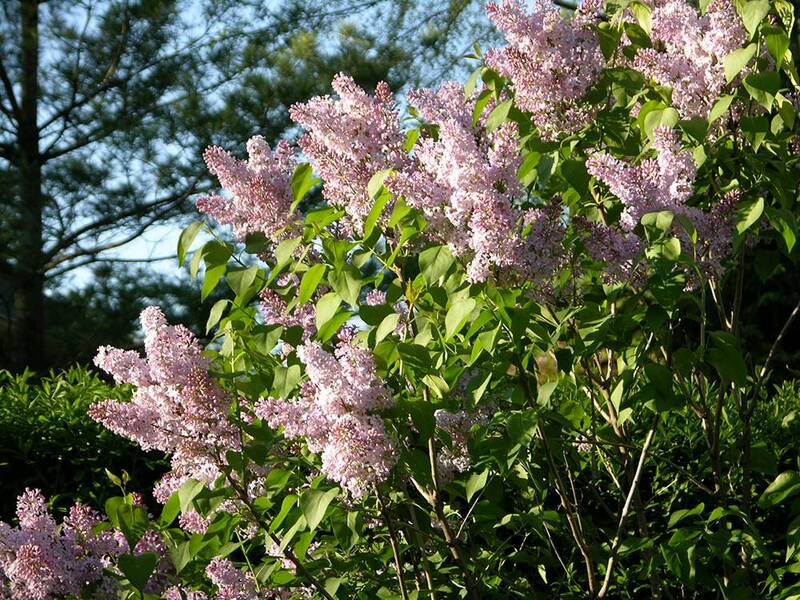 After I had my own home in central Iowa, I dug up small shoots of the lilac bush and started lilac bushes in my own backyard. 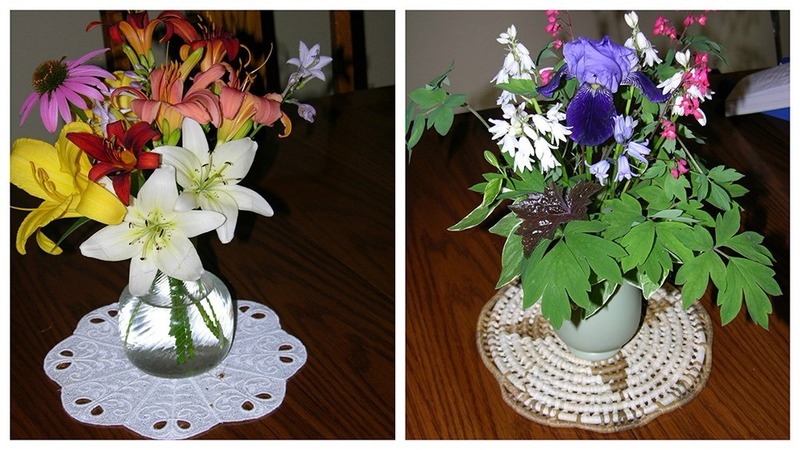 After a few years the blooms were plentiful and each spring I would cut the blossoms and put them in vases for our home and for the library at work. So where did Grandpa Henry and Grandma Olga obtain these plantings back in the late 1920s? I had no idea so I had to ask my dad. 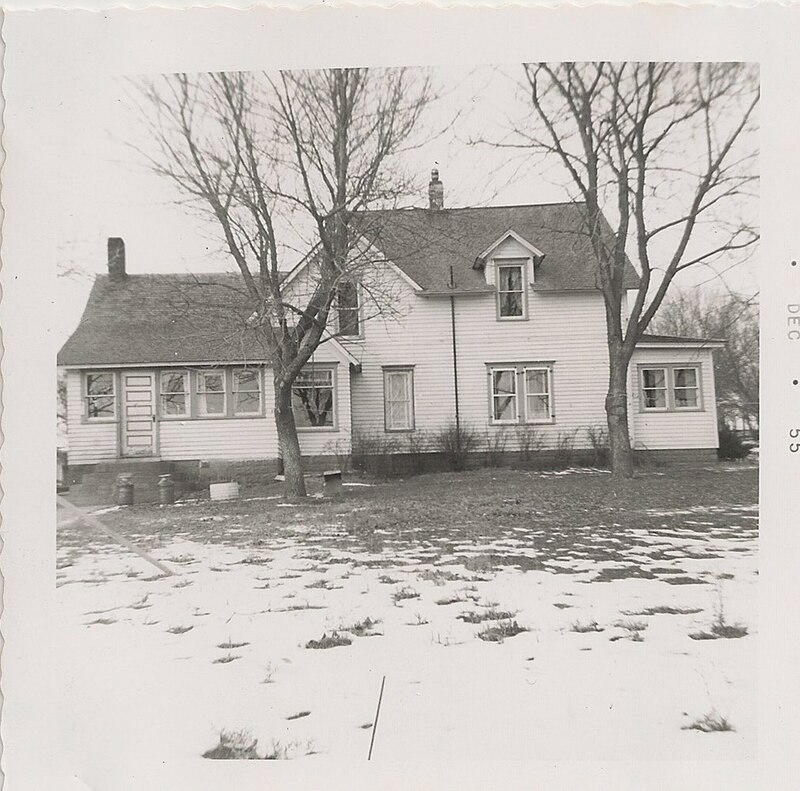 The answer – Earl May, a seed and nursery center that originated in Shenandoah, Iowa that had outposts in local towns during the spring. Earl May learned the nursery business from E. S. Welch, his father-in-law. He started his own retail and catalog business in 1919 and his clever use of radio advertising quickly built up his company. Grandma Olga and Grandpa Henry moved off the farmstead to town before I was born and my mom put her own touches on the flowerbeds. Moving into town did not stop Grandma Olga’s gardening. Her entire backyard was filled with flowerbeds and a vegetable garden. The only lawn was a little walkway by the house and little strips between the flower and vegetable beds. Annually we planted a large vegetable garden on the farm to provide food for our family. The main vegetables grown were peas, green beans, cabbages, tomatoes, sweet corn and potatoes. My sisters and I helped weed the garden and pick the produce. The pails of produce were taken to the house and we would shell the peas and snap the beans. When the sweet corn was ready to be harvested my dad and brother would pick the corn early in the morning and the whole family would sit outside husking the corn. Clean washcloths were used to help remove the silk hairs from cobs of corn. The natural sweetness of the corn attracted flies so I was happy to go inside to help. The ears of corn were blanched in hot water on the stove and then placed in an ice water bath to cool. Next, the corn was cut off the cob and packaged in bags and placed in the freezers. Typically we would “put up” about one hundred quarts of corn. In the fall my dad and brother would plow up the potato plants to harvest the potatoes. One would drive the tractor and the other one would guide the single row walking-plow behind. 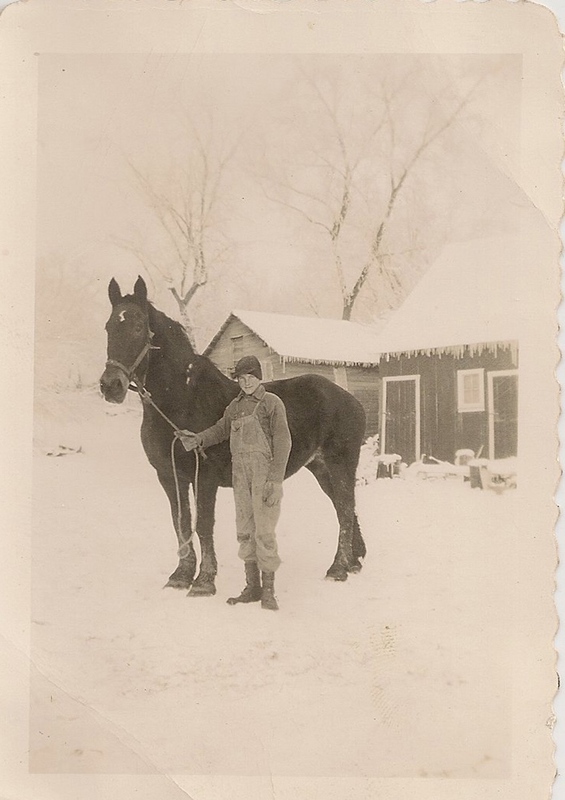 During my dad’s childhood a horse was used instead of a tractor. My sisters and I had the task of picking up the potatoes from the ground. The potatoes were stored in the cave (root cellar) for us to eat during the winter months. Other summer produce was also stored in the cave – canned beans, bread and butter pickles, dill pickles, and sauerkraut. Old crocks of various sizes were used to make the sauerkraut and pickles. Such are my gardening memories of my childhood. 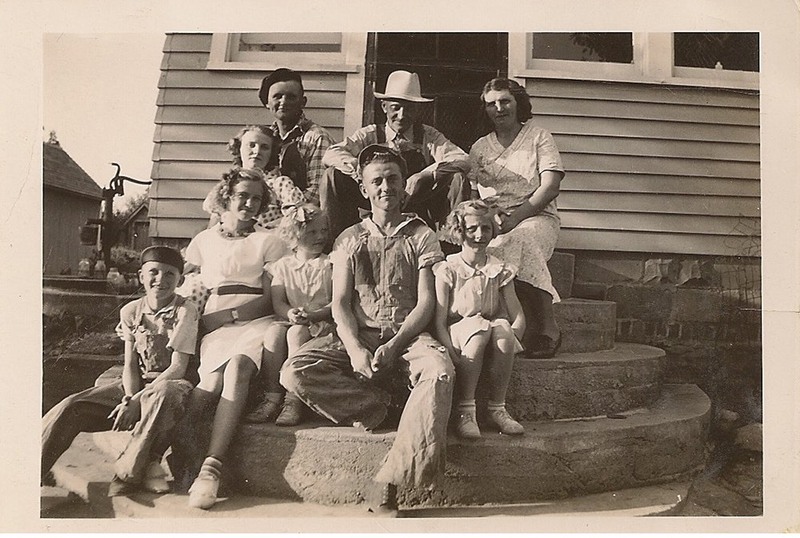 -Story contributed by Sandy C.
First row: Harold (my father), Dorothy, Lorena, Ed, Irene Second row: Alma, Walt, Henry, and Olga. Lorena, the youngest was born in 1934 so I believe this picture is probably about 1939. 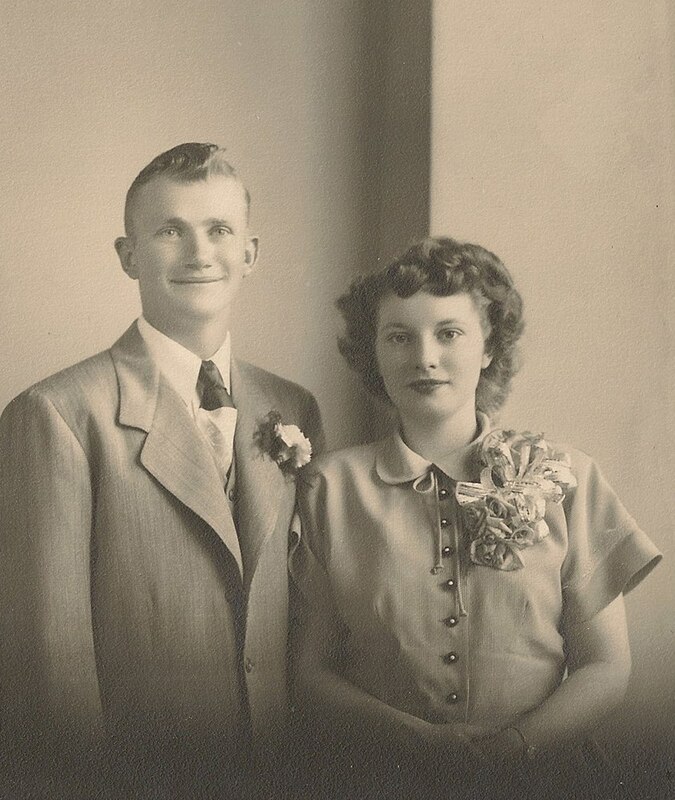 Walt married in Feb. 1940. Dad retired and had a farm sale on January 9, 1994. My parents built a retirement home near Denison and moved into their new home October 1995. 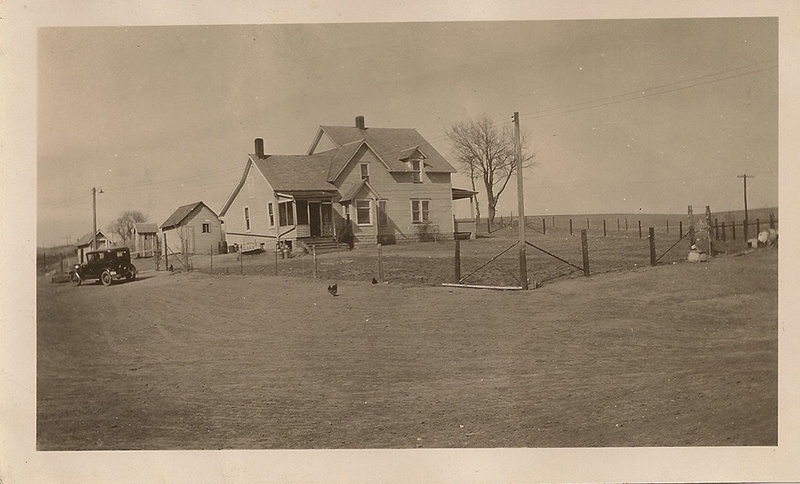 A young couple from the community became the renters for the farm and moved into this house. To this day this couple remains the renters and are like a second family to my dad. Four walnut trees are still present across the front of the home. 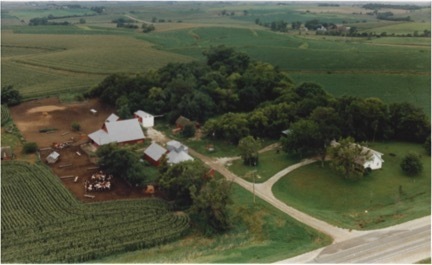 Aerial view of Beermann farm.